Look out for the wonderful Royal British Legion Poppy Appeal collectors who'll be in our stores from this weekend. It's a cause that's particularly important to George Robb from our Queensferry store. He served as a corporal in the 1st Gloucester Regiment and then the Territorial Army during the sixties and seventies, and will be taking part in the parade at the Cenotaph on Remembrance Sunday. George said: "The Poppy Appeal means a lot to me and lots of people I know. It's a very important and emotional cause." George, who's 74, started working at the store in 2003 as a handyman, then moved on to the fish counter. He's married to Sandra and the couple have four children and two grandchildren. As this year marks 100 years since the end of the First World War, George recently went on a visit to the battlefields in Belgium. "I saw The Menin Gate Memorial in Ypres," he said. "It was very sad and brought tears to my eyes." George joined the 1st Gloucester Regiment in 1961. He said: "After my training I went to Cyprus during the conflict between the Greeks and the Turkish Cypriots. "In 1965 I was posted to Mauritius, then Yemen, then in 1967 I was posted to Berlin for two years. My final post was to Northern Ireland in 1969 and 1970, and I then joined the Territorial Army as a fitter. 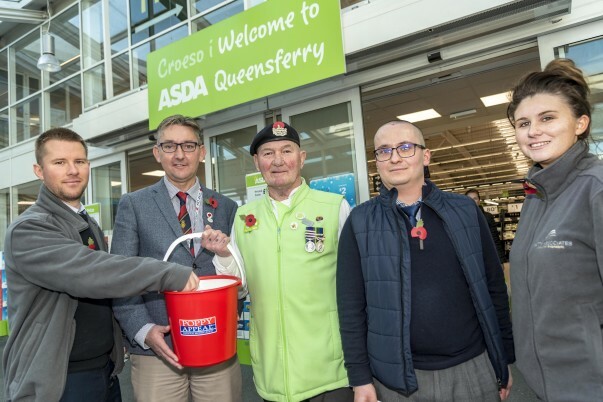 "I'm also a member of the North Wales Cheshire Medallist's Association, and I've been invited to the Cenotaph this year with them on Armistice Day." 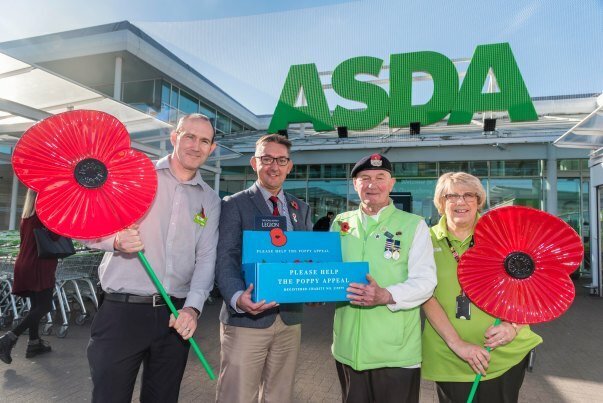 Andy Green, community fundraiser for the Royal British Legion (second left in the picture above), said: "We're so grateful for the continued support of Asda's customers and colleagues with the Poppy Appeal. "This year we're marking 100 years since the end of the First World War. The Royal British Legion is leading a national movement to say ‘thank you’ to the entire generation who lived through the war. "That’s not just the British Armed Forces, but those who fought alongside them from today’s Commonwealth. It’s also the countless men, women and children who played their part on the home front. "More than one million service men and women gave their lives in the First World War so that future generations could live theirs." Volunteers from the Royal British Legion and Poppyscotland will be fundraising in stores until 11th November.